Here's another entry in our charming little quarter hour of music and light banter, "Choose a Song Partner" featuring Beryl Vaughn giving clues for songs that Don Moreland sings, accompanied by organist Adele Scott. Program 9 in the series starts out with "Some of These Days" and also features "A Nightingale Sang in Barkley Square" and Don and Beryl teaming up to sing "Friendship". The show was produced by Eugenia Price Productions and was sponsored by Free Form Bras and Girdles, aiming the show squarely at the ladies in the house. The show was digitized from an original vinyl transcription pressed by Columbia, matrix number YTC 4683. 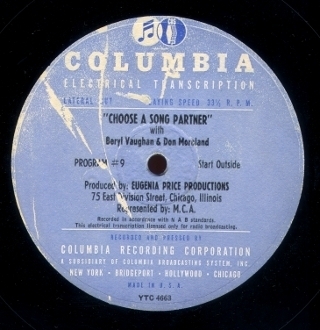 I've only got a few more shows in the unusual little syndicated music series "Choose a Song Partner" featuring cheery Beryl Vaughn giving song clues to Don Moreland who sings the songs to the organ accompaniment of Adele Scott. Program 8 in the series features "Stardust", "Shine On, Harvest Moon", and other tunes. The series was produced and syndicated by Eugenia Price Productions in the late 1940s and was sponsored by Formfit Life Bras and Life Girdles. Our mp3 was directly transferred from a Columbia vinyl transcription, matrix number YTC 4632. Let's revisit a series that I posted several episodes from last year, "Choose a Song Partner". Syndicated in the late 1940s, the show featured Beryl Vaughn giving clues to song titles to Don Mooreland, who has to sing them to the organ accompaniment of Adele Scott. The first song in program 7 in the series is Johnny Mercer's "Love's Got Me in a Lazy Mood". We also hear the old chestnuts "Nellie Bly" and "You Are My Sunshine". The series was produced by Eugenia Price Productions and sponsored by Formfit Life Bras and Life Girdles. Price was a pioneer in radio; she started out as a writer and was one of the first (if not the first) women in radio to form her own production company. She would later be the main force behind the long-running syndicated religious dramatic program, "Unshackled". The mp3 was transferred from an original Columbia vinyl transcription, matrix number YTC-4631. We dive again into our circa 1947 syndicated series, "Choose a Song Partner, from Eugenia Price Productions and featuring vocalist Don Moreland singing tunes based on clues given by host Beryl Vaughn. The show also includes organist Adele Scott and is sponsored by FormFit Life Bras and Life Girdles. In program 6, the songs include "I Wonder Who's Kissing Her Now", "The Martins and the Coys", "How Sweet You Are" and that old novelty tune, "The Sheik of Araby". The program was transferred from an original Columbia vinyl transcription, matrix number YTC 4624. More of these are on the way periodically over the next few months. Another entry in the series "Choose a Song Partner" syndicated circa 1947 by Eugenia Price Productions and sponsored by Formfit Life Bras and Life Girdles. Host Beryl Vaughn offers clues to songs performed by singer Don Moreland and organist Adele Scott. Songs on program 5 include "Rose of Juarez", "Foresticato" (performed solo by Adele Scott), "Supossin' I Should Fall in Love With You" and "Nellie Nie". The show was transferred directly from an original Columbia vinyl transcription, matrix number YTC 4611. We continue our look at the circa 1947 series "Choose a Song Partner" with host Beryl Vaughn offering clues to songs performed by singer Don Moreland and organist Adele Scott. Songs in program 2 include "Stairway to the Stars", "My Heart is a Hobo", and "A Bicycle Built for Two". As usual, the series is sponsored by Formfit Life Bras and Life Girdles and produced by Eugenia Price Productions. The show has been transferred from a Columbia vinyl transcription, matrix number YTC 4724. This week, I'm starting posts of a new series of uncirculated programs from discs that I recently obtained from a collection in Canada. It's "Choose a Song Partner", a program syndicated by Eugenia Price Productions and sponsored by Formfit Life Bras and Life Girdles. Based on the content, the shows appear to date from circa 1947-48. The concept of the show is simple. Beryl Vaughn plays host to the series, giving humorous clues to song titles that are performed by Don Moreland with organist Adele Scott. In program one, Don sings "Stormy Weather", "Peg O' My Heart", "The Way You Look Tonight", and Dinah. The program has been transferred from an original Columbia vinyl transcription, matrix number YTC 4723. I've not been able to find much information about the series and the performers; I'm not even sure if the show was primarily distributed in the US or Canada since the discs came from north of the border. Beryl Vaughn, according to the IMDB, played a bit part in the movie "Penny Serenade" and was also seen on tv's "Sky King". Don Moreland appeared in "Dubarry was a Lady" as part of a vocal group. According to the WFMU blog, Don was active in Chicago radio; someone at WFMU ran into a collection of home recordings by Don and his daughter dating from the 1950s. You can read about them here and here. Eugenia Price had a long and distinguished career in radio, working with soaps in the 1930s and forming her own production company in the 1940s. After a conversion to Christianity, she became a writer and director for the long-running religious drama "Unshacked!" and eventually became an inspirational speaker and author of historical novels. More episodes from "Choose a Song Partner" are coming in future blog posts in the coming months.